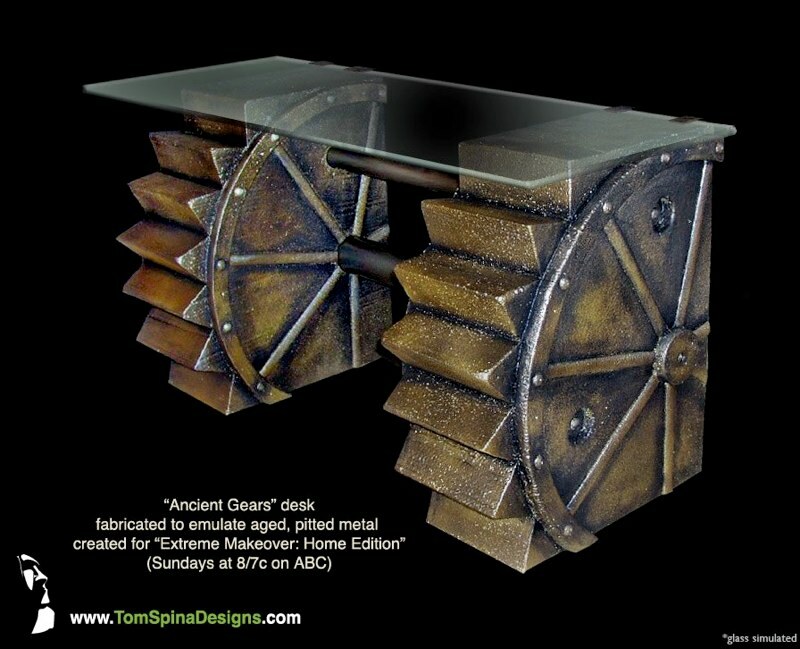 Giant bronze gears create custom steampunk furniture and give a desk an extreme makeover! Our “Ancient Gears” desk, designed and built for ABC’s “Extreme Makeover: Home Edition.” This steampunk furniture was inspired by the family’s interests. The desk was created as foam carved furniture that we custom crafted for the home of the Stott family. 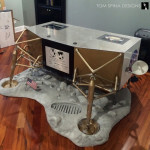 Sculptor Richard Riley fabricated this unique steampunk desk for the show as part of their incredible room design. The piece is made from a mix of hard coated EPS foam, with heavily weathered faux bronze paint and a glass table top. We were so honored to be asked to be a part of this show (even in just a small way) and were thrilled to create our style of custom themed furniture for the Stott family. 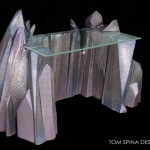 We could create similarly style coffee tables or side tables too. It’s a fun theme and we love exploring this sort of movie set decor as home furniture for people’s man caves, bedrooms or home theaters! 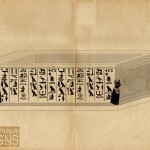 We love finding unique furniture concepts to build for our clients, and hope we can do the same for you someday! 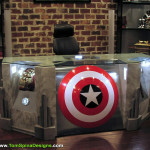 Looking for a one of a kind movie inspired custom furniture?